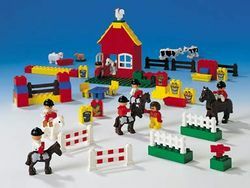 9149 DUPLO Pony Stables is a DUPLO Farm (Dacta) set that was released in 1998. It included 7 DUPLO figures and several horses. Facts about "9149 DUPLO Pony Stables"
This page was last edited on 28 April 2016, at 00:32.